Laboratory exercises. Simplified exercise set for digital network design using VHDL. 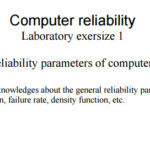 Laboratory exercises.The laboratory exercises are proposed to design a simple signal decoder. You can PREVIEW the materials online (POPUP) by clicking on the image of the file icon, or download to your computer by clicking the link below the icon.